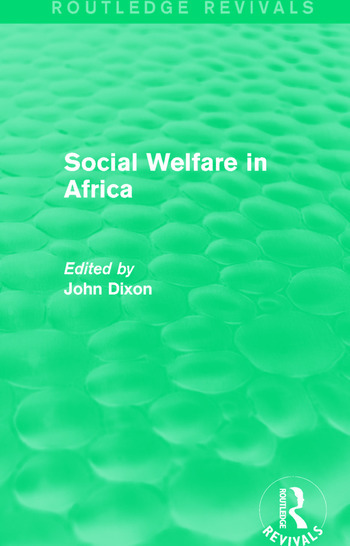 First published in 1987, this book analyses social welfare in the major countries of Africa, at that time. For each country it considers the ideological framework underlying the social welfare system and describes the historical development of both the system and the political and socio-economic context. Each chapter looks at the structure and administration of the systems in place and how these are financed. Contributions examine the nature of the different parts of the welfare system, surveying social security, personal social services, and the treatment of the following key target groups: the aged; those with disabilities and handicaps; children and youth; disadvantaged families; the unemployed; and the sick and injured. Each chapter concludes with an assessment of the effectiveness of the system considered. In this book, particular attention is paid to the role of foreign aid agencies and to missionaries, and to the special problems of poverty and famine in Africa.